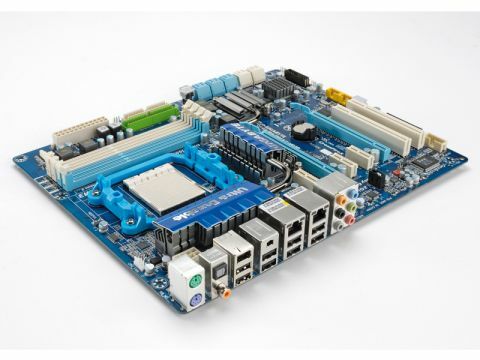 As with Gigabyte's X58, this lavish-looking board totes its 'Ultra-Durable' tech. It sounds a lot like an extra-thick condom, but it's really two ounces of copper designed to spread heat away from the usual hotspots. In theory that makes it an overclocking king, but it could only stomach a frequency bump from 200 to 250MHz. So while it's better future-proofed and more feature-fatted than the Foxconn, given that this AMD 970A chipset board is twice the price for the same performance, it's certainly not worth upgrading to if you've already got a decent AM2+ board to hand. It does, however, have twice the memory sockets and a second PCI-e slot for CrossFire, so you can undoubtedly build a better gaming PC out of it.